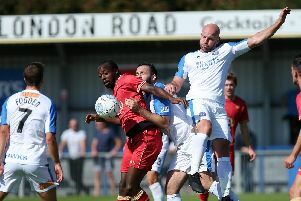 Gosport Borough stood up to the pressure as they hauled themselves out of the Southern League premier division south relegation zone with a 3-1 home win against Frome Town. Against fellow strugglers it was Borough who held their nerve for the vital victory on Saturday. It was a first success in seven games for the home side. After a goalless first half Ryan Pennery struck twice before Pat Suraci sealed the win 12 minutes from time. Frome scored a late consolation goal but Borough already had the points in the bag. Player-manager Craig McAllister lauded Borough’s fight and determination. He said: ‘It has been a long time coming but we finally did it in a pressure game. ‘There was a lot of pressure coming into the game but we stood up to it. ‘We showed the effort and the fight that we are going to need for the rest of the season. ‘The players did what we asked of them beforehand. ‘They showed the desire to go out and win a football match. ‘All our goals were well-worked which was good to see. A first-half of few chances ended goalless but the important breakthrough arrived in the 65th minute. A good move down the right ended with a cross that Pennery bundled over the line. Five minutes later the deadly striker extended Borough’s lead with a composed finish. Pat Suraci sent a great ball between two defenders for Pennery to latch onto. The youngster took the ball round the goalkeeper and slotted it into the net. Pennery turned goal provider for the third with a great run before squaring the ball to Suraci who smashed his shot into the net. McAllister felt the win was always coming. 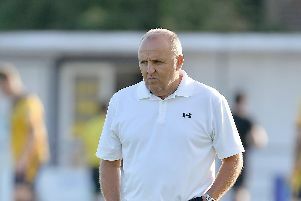 The Borough boss added: ‘In the first half we played some great stuff but didn't take our chances..
‘I wasn’t worried because we were defending well. ‘We told the players at half-time to maintain their belief and it would happen for them. ‘It is vital we use this win as a springboard for further success. ‘It takes us out of the bottom three which is important.